GVC Autocross - What's new this Year? Thank you for your interest in our autocross program! This year we will not be using MotorsportReg. Please check in with registration upon arrival at the event. Numbers can be applied with shoe polish or painters tape (usually available at the registration desk) if you don't have vinyl or magnetic numbers. GVC BMW CCA Top Gun Challenge Rules Our Top Gun Challenge is a fun way for our membership to compete with one another. Points are earned each event and collected at the end of the season. All BMW CCA members are eligible for the Top Gun Challenge. Must be a BMW CCA member by the fourth event of the year. Best 5 out of 6 event finishes count. In the event of a tie the 6th event will be used as the tie breaker. Points are only earned on tires having a tire wear rating (UTQG) of 200 or above. 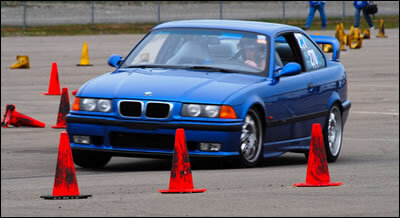 You do not need to have a BMW to autocross with us. We’re all automotive enthusiasts and encourage you to bring any marque to run. However, we do not allow trucks, SUV’s, 4x4, or other vehicles with a high center of gravity to run. • Helmet within one generation of current Snell rating. Must have hologram with SA or M 2005 or newer. Loaner helmets are available to drivers that don't have a Snell-certified helmet. • All participants must have a valid driver's license. • All participants and spectators must sign the GVC waiver on site. Please email the Autocross Chairs for more information on how to participate, instruct, or volunteer at these events. Remember to check our Home Page for the most current event information!